Where is the thyroid gland located? Highly vascularized, butterfly shaped gland located below the larynx. Describe the function and control of the thyroid hormones? Almost every cell in the body has receptors for the thyroid hormones -Generally, the hormones stimulates enzymes associated with glucose oxidation. -They then increase BMR, oxygen utilization, and heat production -They also play a role in nervous system tissue growth, the skeletal system, reproduction, and in blood pressure maintenance -Regulation occurs as the hypothalamus monitors hormone levels and stimulates the anterior pituitary to release TSH as needed. What is the structure of the thyroid gland? Highly vascularized, butterfly shaped gland -Consists of two lobes connected by an isthmus -There is sometimes a pyramidal lobe which extends superiorly from the isthmus -The majority of the gland is the thyroid follicles and follicular cells around them -These cells produce the glycoprotein, thyroglobulin and the two hormones which together make up the colloid. -Thyroxine(T4)Secreted at the highest levels -Converted in the lungs and the liver to T3(Based on how many iodides are attached) -Triiodothyronine(T3) -Released in lower quantities that T4 but it has 10 times the potency of T4 -Most is converted into T4 at the target cell. Describe the synthesis of Hormones in the thyroid? Follicular cells produce thyroglobulin which is released into the lumen of the follicles as COLLOID which are pigs for Iodide -Iodide(I-) is trapped from the bloodstream and is converted to I2 and secreted into the follicle(Attachment of Iodine to tyrosine to form T1 and T2 occurs in the follicle. Describe Chief cells and oxyphil cells? Chief cells although smaller, are the most numerous and are the primary synthesizer of parathyroid hormone(PTH) which antagonistic to calcitonin. -Oxyphil cells thought to be a reserve producer of PTH, but are not fully understood. 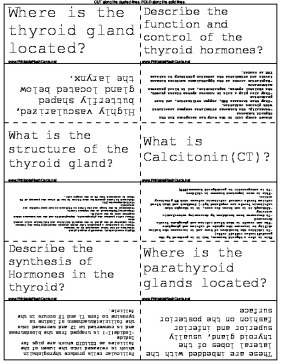 Describe parathyroid hormone(PTH)? PTH and calcitonin are antagonistic -Must then also be important in blood calcium and phosphate homeostasis -PTH will increase osteoclastic activity(this increases calcium and phosphate in the blood) -Increase calcium and magnesium reabsorption from the kidneys -Calcium is vitally important for: Blood clotting, muscle contractions, Nerve conduction -Increased calcium absorption from the gut by promoting the formation of the active form of vitamin D(Calcitriol) -Increases urine phosphate excretion -The net effect of PTH is to increase levels of calcium and magnesium and to decrease the levels of phosphate in the blood.